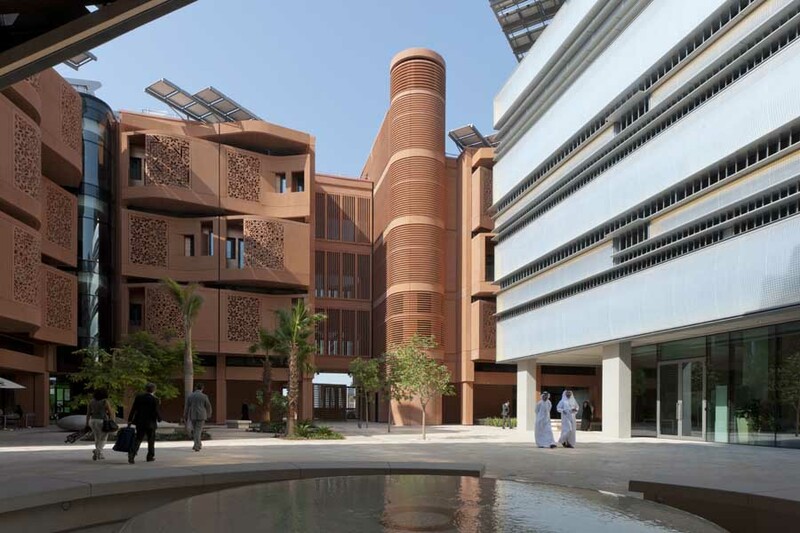 Sheppard Robson’s design for Siemens’ headquarters at Masdar City has established a new model for sustainable office buildings in the Middle East. Siemens Real Estate set clear standards to achieve an innovative office concept with highest quality architectural design, the most efficient use of space and energy and to be one of the first buildings of its kind in the region to have LEED Platinum status. The design began with a simple and over-arching ambition: to maximise efficiency and build more with less. An iterative process of traditional design and parametric analysis resulted in an efficient and compact form that has reduced material and embodied carbon. The project is now on site and is due to complete in late 2012. The building envelope was conceived as a box within a box: an inner highly-insulated, airtight facade designed to reduce thermal conductivity, and a lightweight aluminium external shading system which minimises solar gain while maximising daylighting and views from the building. The variation in the form of the shading systems was designed to offer legibility to the architectural expression with each facade tailored to suit its solar orientation. Lightweight aluminium with a low thermal mass and high albedo function further reduces solar radiant heat transfer while maximising indirect daylight penetrating the floors. The office floorplates, each of 4,500m², have been optimised for efficiency, daylight and flexibility using parametric modelling and achieve over 90% efficiency. They are punctuated by nine atria and served by six perimeter cores. Completely column-free floorplates incorporate 15m spans by using an innovative post-tensioned flat slab with integrated void-forming technology. This reduces the material used by approximately 60% and provides maximum flexibility for the office space planning. The arrangement enables each of the floors to be subdivided into a combination of various space sizes and therefore creates flexibility for the building to be remodelled over time to accommodate between one and 32 tenants. The office floors float above a fully shaded public plaza which connects the level change between the existing adjacent podium and the more formal square with its Light Rail Transport station. The plaza has been conceived as a terraced extension of the existing public realm and encourages pedestrian movement within the heart of the site. The introverted nature of the shared public realm is further enhanced by a series of external rooms, retail units and two fully glazed office receptions. In addition to maximising efficiency of all aspects of the built form, the integrated engineering systems have been optimised to complement the building’s function and low carbon design. Rigorous energy modelling has ensured that the building performs 44% better than the baseline ASHRAE energy model.